Thank you messages from the voices of "Moment in Time: Seattle Seahawks Allen Era 20 Year Anniversary"
Leading up to the Seahawks&apos; home opener on Sunday, September 17, we will celebrate Paul Allen’s 20 years as owner of the franchise through a four-part series on Seahawks.com. 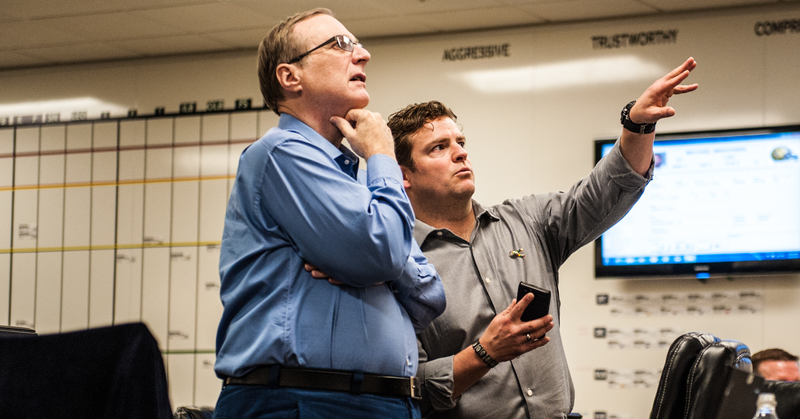 In part one, we look at how Allen has laid the foundation for a winning culture in Seattle. 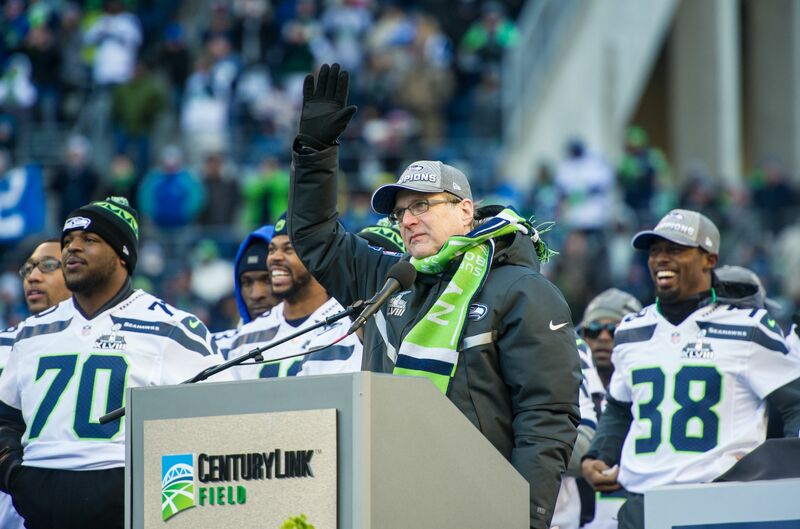 Paul Allen stood on a stage at CenturyLink Field on an unusually cold February afternoon, surrounded by Seahawks head coach Pete Carroll, general manager John Schneider, president Peter McLoughlin and the players who had just helped the team to the first Super Bowl victory in franchise history. Allen, a Seattle native and the owner of the Seahawks since 1997, surveyed the crowd that was reveling in the championship his team had won three days earlier. In a lifetime full of professional victories, this was one of the biggest. “As an owner who was born and raised here, it’s a very special moment and the fulfillment of a dream, not just for me, but for everyone on the team,” Allen told the fans braving the cold at CenturyLink Field. Seattle Seahawks owner Paul Allen addresses fans inside CenturyLink Field following the team&apos;s Super Bowl XLVIII victory parade through the streets of downtown Seattle. That Sunday evening in New Jersey when the Seahawks beat Denver in Super Bowl XLVIII, and the parade that followed with hundreds of thousands of fans filling Seattle’s streets, those moments were the culmination of years of hard work, the high point for the franchise, and further evidence of the impact Allen had made not just on an NFL team, but on an entire region since he bought the Seahawks and saved football in Seattle. Full game highlights from the Seattle Seahawks&apos; 43-8 victory over the Denver Broncos in Super Bowl XLVIII at MetLife Stadium. While that Super Bowl victory was, up to this point at least, the high-water mark in franchise history, it has hardly seen lean times since. Over the past three seasons since Super Bowl XLVIII, the Seahawks have won two more NFC West titles, gone back to the Super Bowl once, and been to at least the divisional round of the playoffs every year. Since Allen took over the Seahawks, they have been to the playoffs 12 times, won nine division titles and been to three Super Bowls, and the Seahawks have won 10 or more games for five straight years, winning at least one playoff game each of those seasons. And plenty of people have made huge contributions to those successful teams, including head coaches like Carroll and Mike Holmgren, as well as executives like Schneider, McLoughlin, and Tim Ruskell, and of course numerous players have huge roles in Seattle’s success, but the one constant over the past 20 years as the Seahawks have evolved into one of the league’s model franchises has been Allen. Before Allen could celebrate playoff berths, division titles and even a Super Bowl championship, he had to produce one of the most important victories in franchise history—the one that would save football in Seattle. With the Seahawks in the midst of the most successful run in franchise history, both in terms of the on-field product and the business side of the operation, it can sometimes be easy to forget how bleak things were before Allen entered into an option to buy the team, then exercised that option a year later. The Seahawks were in the midst of a long playoff drought in the mid-90s, and hadn’t won a postseason game since 1984, and then-owner Ken Behring wasn’t just thinking about relocating the Seahawks to Southern California; he had actually started the process following the 1995 season. The search was on for a potential owner with local ties and deep enough pockets, and it didn’t take long for local politicians to realize that Allen, who already owned the NBA’s Portland Trail Blazers, was the man for the job, that is if he had interest in owning an NFL franchise. In the mid-90s, NFL teams weren’t a sure bet, from a financial standpoint, like they are now, especially not in a midsize market with an aging stadium. And Allen had always been more passionate about basketball, so convincing him to buy the Seahawks wasn’t necessarily a slam dunk. 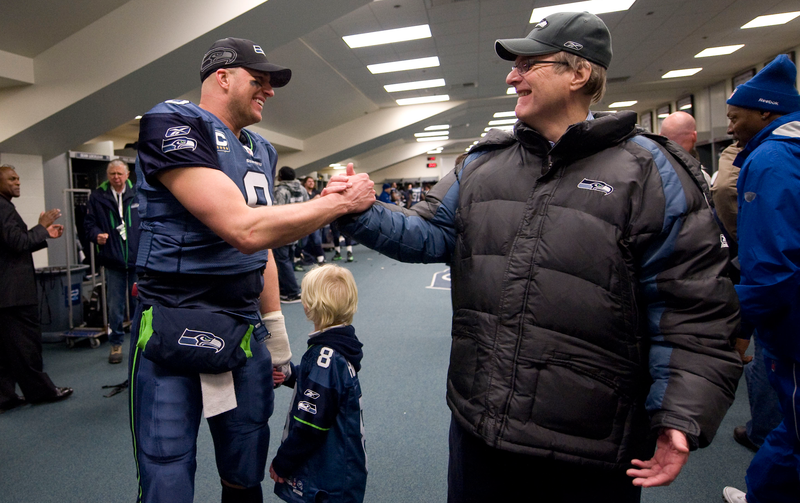 But Paul Allen and Jody Allen had been raised by parents, Faye and Kenneth, who instilled in them at an early age the importance of giving back to the community, so even if there was significant risk in the purchase from a business perspective, and even if it would mean sacrificing more of his privacy, Allen agreed to purchase the team. “If I entered the NBA out of passion, I was called to the National Football League out of civic duty,” Allen wrote in his 2011 memoir Idea Man. 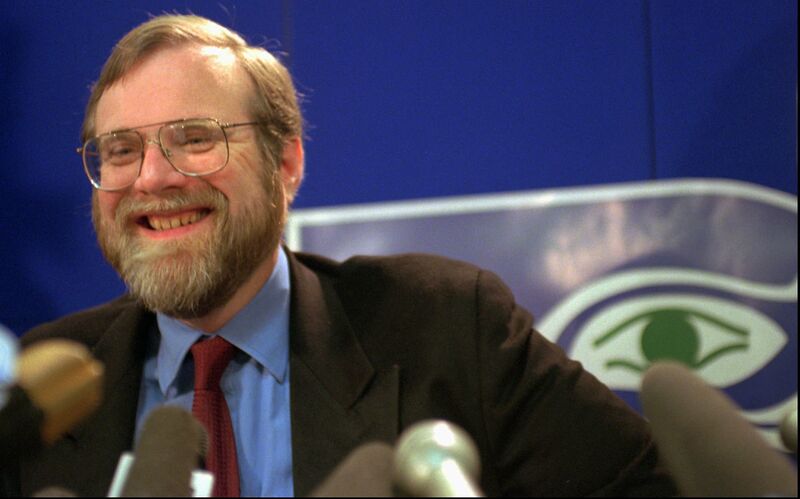 In a June 1997 campaign ad for Referendum 48, Paul Allen vows to "do what it takes to make the new stadium and exhibition center a success," both personally and financially, if voters state-wide agree to pass the stadium funding bill. Yet agreeing to buy the team was only part of the process. Next up, Allen and his team had to win a vote. For what is now CenturyLink Field to be built, voters state-wide needed to pass a stadium funding bill, Referendum 48—that’s XLVIII in Roman numerals, if you’re the type who believes in omens. Allen agreed to fund the cost of the election, then he and his team went about making sure it would pass. The election, held on June 17, 1997, went down to the wire, but passed by a 51.1-percent to 48.9-percent margin, with the victory party including Allen on guitar. Allen, his team, local politicians, and passionate football and soccer fans all worked hard to pass Referendum 48, and on that June day 20 years ago, football in Seattle was saved. 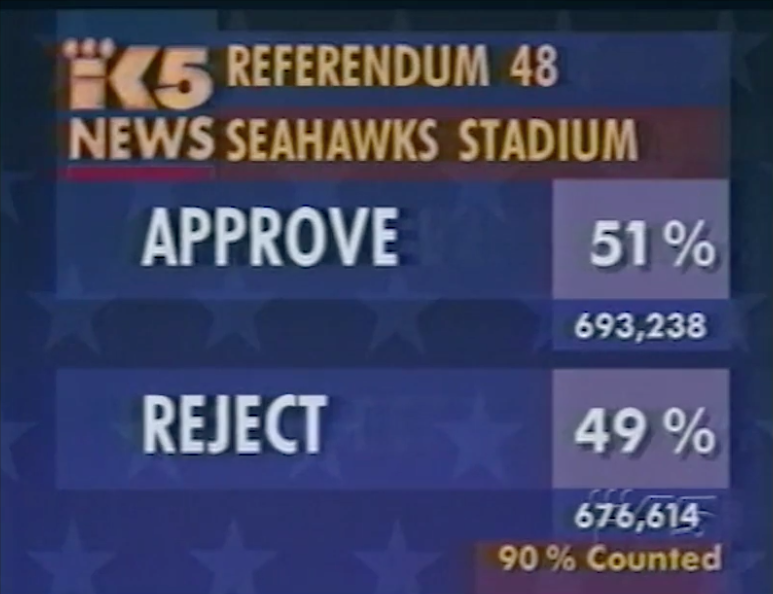 On June 17, 1997, Washington state voters passed Referendum 48 by a 51.1-percent to 48.9-percent margin, approving stadium funding for what is now CenturyLink Field. A man who has succeeded in so many walks of life, from business to philanthropy to sports, Allen saved one of his biggest victories for an election that would change the sports landscape in Seattle, paving the way for the Seahawks’ long run of success in Seattle and the eventual addition of Major League Soccer to the Seattle sports landscape. “Paul Allen is a unique individual, period,” Rice said. “He’s quiet, but he’s firm. He knows what he wants and he goes after it. He doesn’t necessarily need to be in the forefront of everything, but he wants to make sure that we are all moving in the same direction, and I think that’s what kept it going. Nobody was trying to one-up anybody; we knew who Paul was, we knew what he was bringing to the table, and we wanted to make it achieved. And that was that stadium. And as the Seahawks contend for division titles every year, and as Carroll and Schneider are regularly recognized as two of the best in their professions, and as multiple players represent the Seahawks in the Pro Bowl every season, it’s sometimes hard to remember a time when that wasn’t a case. But prior to Allen taking over the team, there was a long period between the peak of the Chuck Knox era and the late 90s when the Seahawks might have best been described as an NFL afterthought. Allen doesn’t pretend to be a football expert—he isn’t giving Carroll Xs and Os advice on gameday, nor does he tell Schneider and his scouting department who to sign or draft—but he is a brilliant businessman who knows how to hire the right people and push the right buttons. And having succeeded in so many different fields, Allen helped instill an innovative, forward-thinking culture in the Seahawks organization. “The way that Paul has established a championship culture is just that curiosity and the constant striving like there’s no finish line,” Schneider said. “We talk about that all the time here, how are we going to do it better than anybody’s ever done it before? I mean look what they did with Microsoft, right? How are we going to take that attitude of never thinking that we’re satisfied or never thinking that everything is good enough? The Seahawks have also been successful the past two decades because Allen isn’t afraid to make bold, and at times expensive, moves to improve his team. After Holmgren stepped down, and after the Seahawks went 5-11 in 2009 under Jim Mora, Allen opted to hit the reset button rather than wait and see how things would play out. That move was costly, as Mora had several years remaining on his contract, and could have been viewed as a rash decision—coaches are rarely fired after just one season—but in the long run, it was unquestionably the right decision for the franchise. Allen again made a headline-grabbing hire, prying Carroll away from USC after the national championship-winning coach had said no to the NFL so many other times. Schneider was hired days after Carroll, forming an unlikely pairing that became one of the most successful and harmonious coach-GM relationships in the league, kicking off the most successful period in franchise history. “Paul is such a good owner because he cares, and he cares about putting on the field the best team he can to represent the community and to give them all the tools he can to succeed,” Kolde said. “And as part of that he’s made it a point to try to bring in the best coaches, the best executives to help as part of doing everything he can to maximize the probability of success. So he’s tried to give the team everything he can to make it successful." As important as it has been for the Seahawks to hire the right people to run the organization, another big factor in Seattle’s success is how people like McLoughlin, Carroll and Schneider, and by extension, Allen, create a positive culture that breeds success both on the field and in the business side of the organization. “It’s a place where you want to come in and work, and I think that’s the atmosphere and the environment that he has kind of set,” said All-Pro linebacker Bobby Wagner. “He has allowed us to be successful as we are, and it’s going to be successful as long as he’s here, because he has been an amazing person. After every home game, he’s probably the first person that acknowledges us when we walk through the door. And you know, I don’t know if he knows we appreciate it every time we see him in there and we just love his presence. The Seahawks have been one of the league’s most successful franchises since Allen took over, and after five straight playoff berths, Carroll feels like his team is still “right in the middle” of its current run of success. But before the Seahawks could become the model franchise that they are today, before that celebration could take place three-and-a-half years ago, Allen had to step up to buy the team and kick off an era of winning by earning, in the polls, one of the most important victories in Seattle sports history. In part two, we look at how Allen&apos;s philanthropic efforts have positively impacted the Seahawks, the Seattle region, and the world as a whole. Kenneth Allen and Edna “Faye” Gardner, classmates at Anadarko High School, left their Oklahoma home for Washington state following World War II. The newlyweds settled in Seattle in 1949, enabling Ken to attend the University of Washington where he would devote his professional life to improving the school’s libraries. 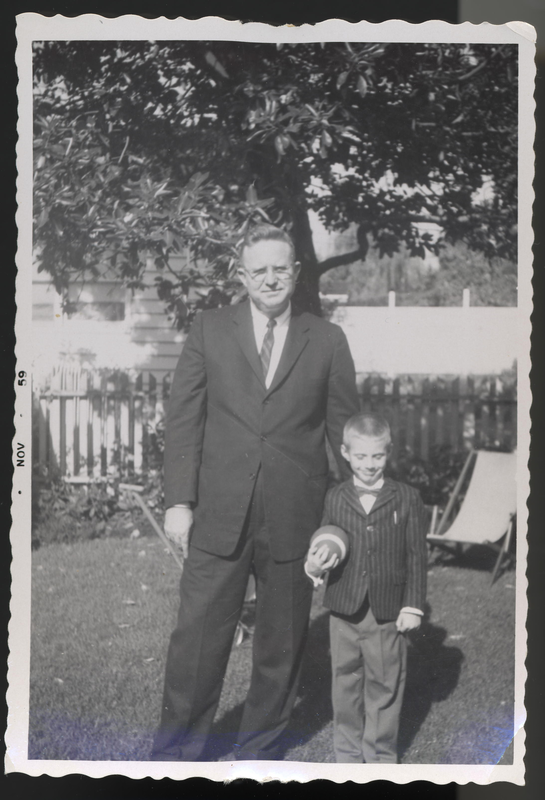 Following his graduation in 1951, Ken began his career as a reference librarian and served Library School students as an instructor from 1954 to 1958. In 1960, he was appointed Associate Director of Libraries, a role he held until 1982. Faye, meanwhile, transitioned from her childhood job at a small-town Oklahoma library, working at the University Libraries from 1949 to 1951. She taught fourth grade in the Seattle area at Ravenna School, instilling a love for books into her students. To this day, her passion for literature continues to be passed on at the Seattle Central Library, home to the Faye G. Allen Children’s Center, and through the Paul G. Allen Family Foundation’s Faye G. Allen Library Program, which supports the growth and success of local libraries. While both of his parents have passed — Ken in 1983 and Faye in 2012 — the pair had a tremendous impact on shaping Paul’s, as well as his sister Jody’s, compassion for community. The philanthropic efforts Allen has spearheaded with the help of his fortune are nothing short of extraordinary. With a lifetime giving total that exceeds $2 billion, he has spent his career tackling some of the world’s biggest challenges, striving to shorten the distance between the impossible and possible. In August 2015, it was announced that Paul Allen would receive the Carnegie Medal of Philanthropy, an award established in 2001 and given every two years to individuals who, like Andrew Carnegie, have dedicated their private wealth to public good. From world issues such as climate change, ocean health, wildlife preservation, and pandemic preparedness and prevention to focusing contributions on brain research, homelessness, and exploring critical questions in Artificial Intelligence, to pledging support for the sustainment of local neighborhoods, education, culture, and arts, Allen has had a hand in the advancement of just about everything one can think of. “I think he set the pattern,” von Reichbauer said. "He did that as a result of the values that his mom and dad instilled in him. This is someone who grew up as the son of the assistant librarian at the University of Washington library, and he did not have a lot of resources, but I know for a fact his mother, Faye, who I had a chance to meet and talk to on a number of occasions, really instilled in her kids about giving back to the community, and she truly loved this community. In October 2015, Paul Allen was honored with the Carnegie Medal of Philanthropy during a private ceremony fittingly held at the New York Public Library. “I grew up spending many happy hours in the book stacks at the University of Washington Library," Allen said in his acceptance speech. "I trace my curiosity and the diversity of my endeavors at least in part to my early exposure to the wide world of ideas, and it is enduring belief in the power of new ideas that informs my philanthropy." While Allen has his parents to thank for instilling a philanthropic nature in him, several Seahawks have the team owner to thank for helping pass on those same philanthropic principles to them. Cliff Avril recaps his humanitarian trip to his native land of Haiti, where through his foundation, The Cliff Avril Family Foundation, the Seahawks defensive end has committed to building a school, hosted health clinics and football camps, as well as aided in the construction of homes capable of withstanding natural disasters. And when it comes to giving back, there is certainly no shortage of Seahawks players who continue to influence with the work they do when they step foot off the gridiron. Several star players have formed foundations of their own to positively impact the Seattle community, their hometowns, or both. From Cliff Avril, Michael Bennett, Richard Sherman and Kam Chancellor on the defensive side of the ball to Doug Baldwin, Jimmy Graham, and Russell Wilson on the offensive side and every player in between, the Seahawks have made it a priority to make plays in the community as well as on the field. “I think everything is inspired by the leader of your organization, the leader of your team,” Bennett said of Allen. “His influence in the organization is built around community, so if you’re part of the Seahawks you’re part of the community, and we give back on every single level, if it’s just locally, statewide, nationally and even globally. Seahawks defensive end Michael Bennett explains why his foundation has hosted O.C.E.A.N. (fighting Obesity through Community, Education, Activity and Nutrition) youth sports camps for the last five years. 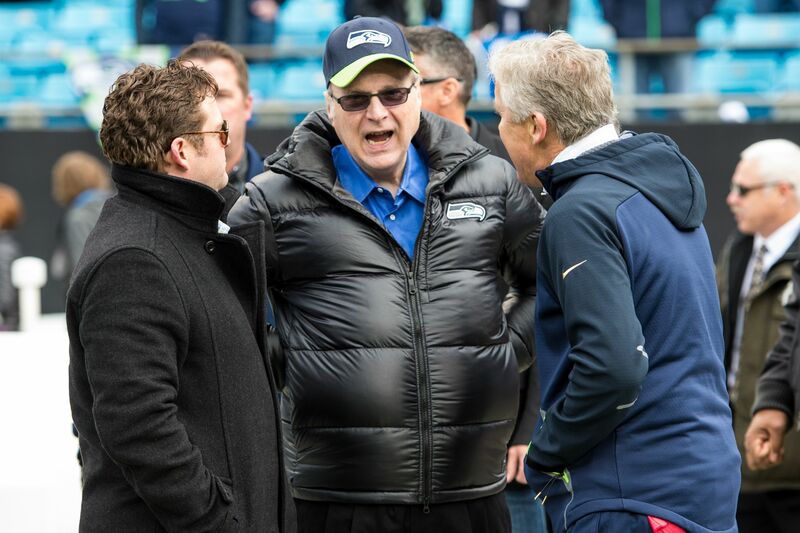 While Seattle players have championed causes ranging from childhood obesity to youth diabetes, and from providing resources to the underprivileged to pediatric cancer, Allen’s influence also extends to the Seahawks coaching staff and senior management. Head coach Pete Carroll, who works to reduce and prevent youth and gang violence through A Better L.A. and A Better Seattle, as well as general manager John Schneider, who with his wife Traci help children with autism reach their full potential through Ben’s Fund, a program named after the couple’s autistic son Ben, have each taken their philanthropic endeavors to new heights under Allen’s ownership. Seahawks general manager John Schneider and his wife Traci, in partnership with Families for Effective Autism Treatment (FEAT) of Washington, annually host a &apos;Prime Time&apos; celebrity waiter event geared toward raising money for Ben&apos;s Fund. 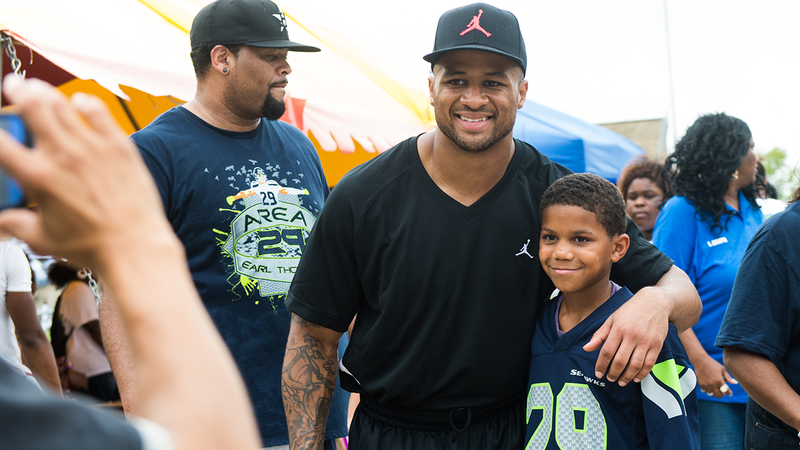 Organizationally, not just individually, the Seahawks have taken steps to aid Allen’s Seattle-area philanthropic efforts, and the team’s Spirit of 12 program is a prime example. Founded in 2004, the program embodies Allen and the team’s commitment to the Pacific Northwest. 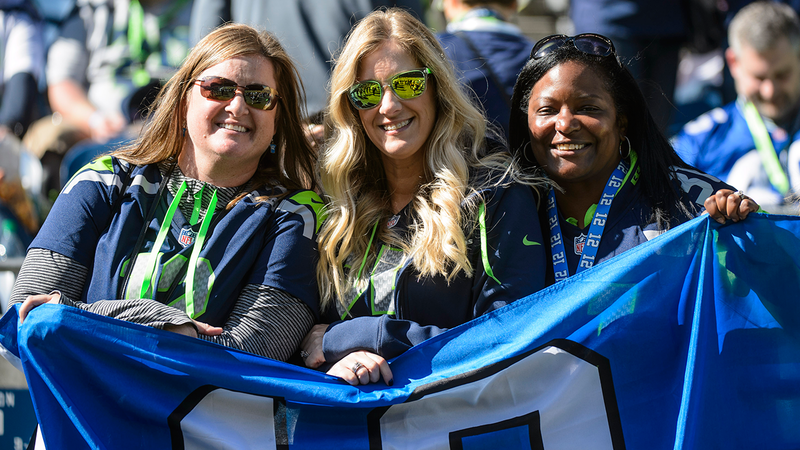 At every Seahawks home game, youth service organizations align with The Paul G. Allen Family Foundation to raise funds for kids’ programs. 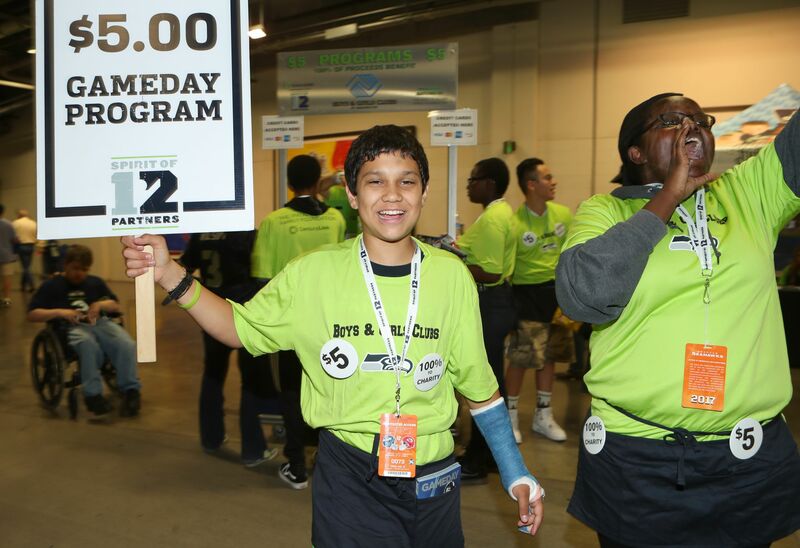 The club’s Spirit of 12 Partners, which this year include Rainier Scholars, Boys & Girls Clubs of Washington State, Camp Fire Snohomish, Outdoors for All, and Big Brothers Big Sisters of Puget Sound, distribute the team’s gameday program magazines, keeping 100 percent of the proceeds which are then matched by Allen’s foundation. Since the program&apos;s inception, more than $3.8 million has been raised. Examples Allen set after putting the morals his parents instilled into practice. 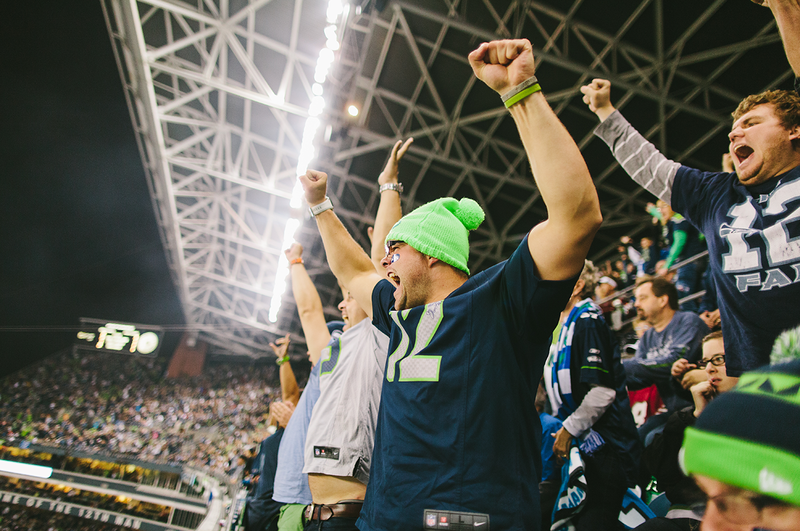 In part three, we look at how Allen helped bring Seattle&apos;s passionate football fanbase closer together, further uniting 12s at one of the loudest venues in sports. A sea of more than 700,000 12s braved sub-freezing temperatures to take to the streets of downtown Seattle, where they would welcome home their Seahawks team that three days prior had claimed the first Lombardi Trophy in franchise history. They were there to “Celebrate 48,” which was set to honor the Super Bowl XLVIII-winning Seahawks with a victory lap through the city, starting under the shadow of the Space Needle at Paul Allen’s Museum of Pop Culture before crawling 2.4 miles down 4th Avenue and culminating with an intimate ceremony inside CenturyLink Field. Whether they were situated on rooftops, hanging outside business or apartment windows, or carefully perched atop street signs, fans who couldn&apos;t snag a spot up close along the parade route found unique ways to secure a glimpse of the their championship club. People of all ages from all across the Pacific Northwest showed up for the Wednesday morning celebration, with adults skipping work and parents wisely choosing to pull their kids out of school for a monumental event in Seattle’s history. Richard Sherman blew kisses into the crowd. Doug Baldwin’s voice grew hoarse as he hollered at swarm after swarm of 12 flag-waving supporters. Kam Chancellor bounced to the beat of Rick Ross’s “Hold Me Back” as the vehicle he was riding cruised past Westlake Center. Russell Wilson triumphantly hoisted the team’s Super Bowl hardware for all to see. And in between bops on an American-Indian hand drum he had procured from a willing fan, Marshawn Lynch tossed handfuls of Skittles into the crowd. “What an incredible day we had today,” Seahawks head coach Pete Carroll said after the Super Bowl ceremony at the stadium. “Gosh, there are just not enough words to describe the emotion and the exchange that was given from the fans to our players and from our players to the fans. The best moments from the Seattle Seahawks&apos; Super Bowl XLVIII victory parade, as fans flooded the streets of downtown Seattle to celebrate with the team. The over-the-top celebration epitomized part of what Allen hoped to accomplish when he agreed to buy the team to keep the franchise in Seattle. While putting a quality team on the field was indeed a priority, so was developing a stronger connection with the fan base, and establishing the Seahawks as a unifier within the community. "I think the Seahawks have been a very powerful unifying force and that’s never more apparent than in the playoffs,” said Bert Kolde, Seahawks vice chairman and senior director of Vulcan Inc. "When you can drive around any neighborhood in Seattle and people have their 12 flags and they’re wearing their colors and you can just see that it permeates neighborhoods, all demographics. “We Wanted To Give The 12s Every Edge We Could"
When Allen undertook construction of CenturyLink Field where the Kingdome once stood, he had the 12s in mind. As a kid, Allen would attend football games with his father at Husky Stadium, a venue that would ultimately influence the design of the Seahawks’ new home. Allen was attracted to the stadium’s vertical intimacy that allowed those in the upper deck to feel as though they were still close to the action on the field. A traditional roof wasn’t in the cards, either. Allen preferred the open-air feel of Husky Stadium that showcased the Pacific Northwest’s scenery, and in the Seahawks’ case, showed off the city’s urban vista and nearby Pioneer Square. Instead, like at Husky Stadium, Allen opted for the roof overhangs fans know today, which double as weather protection for most of the stadium’s seats as well as a potent weapon when the Seahawks are on defense. “By making the seats as close as possible to the field and by putting in a roof system we also knew that we were maximizing the channeling of sound off the field so that the crowd sounds were either coming directly on the field or they were ricocheting off, being reflected by the roof structure back down onto the field,” said Kolde. "We wanted to give the 12s every edge we could and help amplify that in a natural way, and I think we succeeded." Arm CenturyLink Field’s unique design with the League’s loudest fan base and the end result yields one of the best home field advantages in the NFL. Since the 2005 season, no club has generated more false starts at home (155) than the Seahawks, and since moving to the NFC in 2002, the Seahawks&apos; first year at CenturyLink Field, Seattle has the League’s second-best home winning percentage (.708) with an 85-35 record and is one of just two teams (Green Bay Packers) to record 80-plus home wins in that span. Since 2003, all but one game has sold out, giving the club 122 consecutive sellouts heading into the 2017 season, including playoffs. “The 12s are a unique fan connection, because when a fan is a 12 they’re not just a fan, but they are connected to the team,” Kolde said. “When they’re there at the stadium as a 12 they’re helping to influence the victory with their cheering, creating a difficult environment for the opponents. They’re not on the outside looking in. They are part of the team and they are part of the victory." Seahawks middle linebacker Bobby Wagner can attest to Schneider’s point. The 12 Flag has become a symbol for all those who support the Seahawks. Yet even more than impacting the opposing offense with deafening audibles, Seattle players and coaches find ways to feed off the fans as energy levels dip late in the game. The Seahawks franchise was just eight seasons old when it retired its first jersey number. The No. 12 was hung up in honor of Seattle’s fan base in 1984, 11 years before the club would recognize a player with a jersey retirement (Steve Largent, No. 80, 1995). In 2003, under Allen’s watch and direction, the 12s were honored once again, this time with a flag. That year, prior to an October game against the San Francisco 49ers, 12 original season ticket holders hoisted a 12 flag at CenturyLink Field just before kickoff, a tradition that stands today. At every home game, former Seahawks greats as well as local celebrities and sports personalities raise the flag in honor of the 12s, signaling the spirit of community that the organization and fans share. The 12 flag has become one of the modern-day symbols of the Seahawks, with the team even choosing to buck a longstanding trend with their Super Bowl championship visit to The White House, where they presented then-President Barack Obama with a 12 flag rather than a jersey with his name on the back. Allen has raised the flag on three separate occasions, hoisting No. 12 up the pole before each of the three NFC Championship games (2005, 2013, 2014) the Seahawks have won. 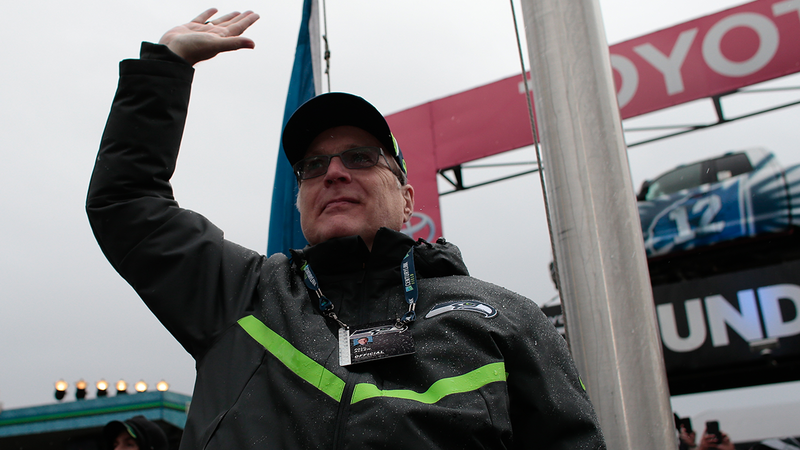 Highlights of Seahawks owner Paul Allen raising the 12 Flag prior to the team&apos;s NFC Championship game against the 49ers on January 19, 2014 at CenturyLink Field. Seattle defeated San Francisco, 23-17, to advance to Super Bowl XLVIII. “What He Saw Was A Chance To Bring The Community Closer Together"
For all the false starts forced, 12 flag&apos;s raised, and seismic activity caused at CenturyLink Field, the Seahawks’ connection to their fan base goes well beyond gameday. 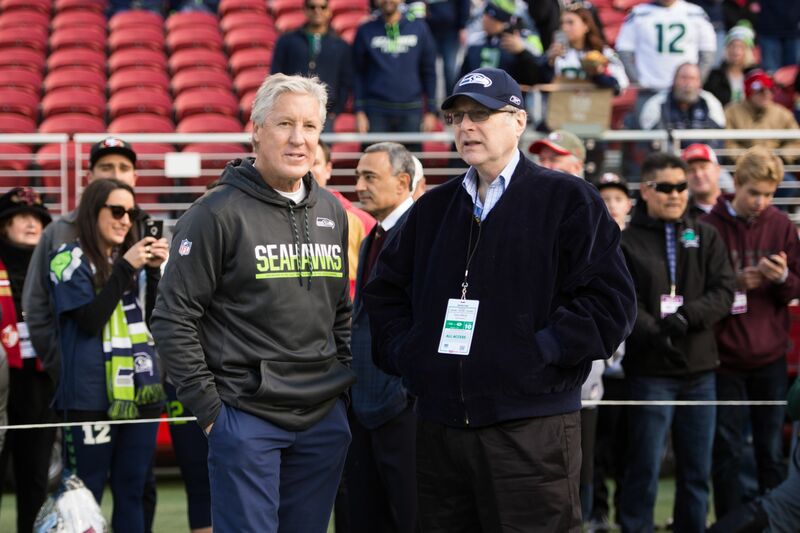 “The Seahawks really are a perfect reflection of his attitude and commitment to community,” Gary Locke, who was King County Executive when Allen bought the team, said when discussing Allen’s Seahawks ownership. 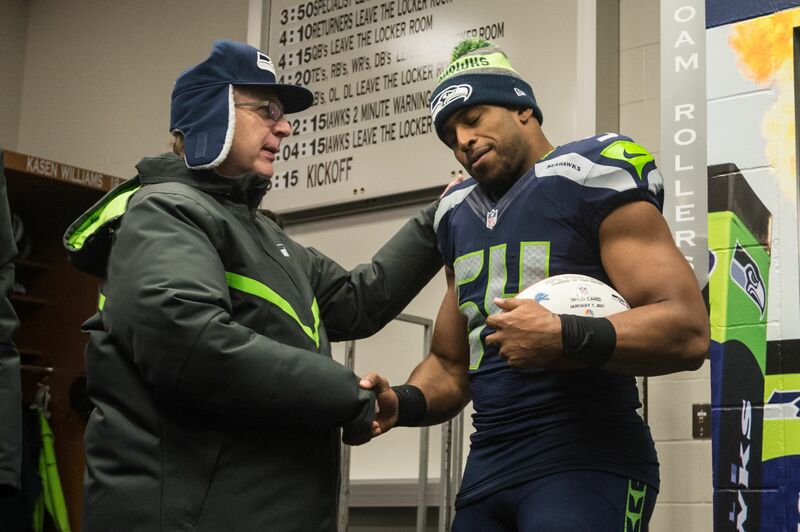 "How the Seahawks have really galvanized the community and really generated so much spirit. Everywhere you drive you see flags, the 12 flags flying. You see Seahawks banners on business windows, on automobile antennas, on bumper stickers and everything else. People of all ages, boys and girls wearing the jerseys of different players. The Seahawks have really captivated the community. “The Seahawks to a person have been incredible ambassadors, more than just football players and more than just providing entertainment for us in the community,” he added. “But they’ve also really helped provide enthusiasm and spirit and vision in our community and really making our community, I think, a better place to live, work, and to raise a family." Captivating the community starts with showing face in the community, something many players — current and former — aren’t afraid to do in a town that feels as passionate as it does about its professional football. When they’re not at work, Seahawks players, coaches, and staff are constantly finding ways to strengthen the already rock-solid bond the team has with the 12s. Sports can be a powerful unifier, and as Raible notes, what the city of Seattle has in Allen’s Seahawks should be viewed as one of the best in the business. In part four, we look at how Allen&apos;s leadership and inquisitive thinking keeps us at the forefront of competition. 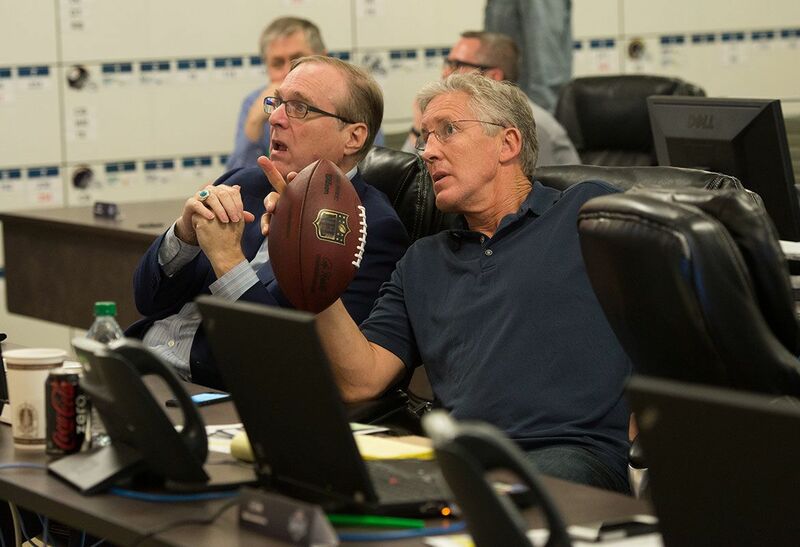 For several years, NFL teams came calling, and Pete Carroll kept saying no. After finding himself as a coach in the college ranks, Carroll was hesitant to return to the NFL, where he had been twice fired as a head coach, because no team was able to offer the right setup. Then in January of 2010, Paul Allen and the Seahawks approached Carroll, and suddenly the NFL was a very real consideration for one of college football’s best coaches. “This is exactly the format and makeup of the job as I’ve envisioned it,” Carroll said on the day he was introduced as Seattle’s head coach. Pete Carroll details what attracted him to the job in Seattle and outlines expectations for his first year as head coach of the Seahawks. Leadership can show up in a lot of different forms, sometimes in knowing when to step in and make tough decisions, sometimes in making the right hires, and sometimes, it’s recognizing when it’s best to put the right people in place, then take a step back in order to let those people operate at their best. Allen, the owner of the Seahawks for the past 20 years, did all of those things when he oversaw coaching and front office changes following the 2009 season, moves that kicked off the most successful era in franchise history. There are different ways to successfully run an NFL franchise. Dallas Cowboys owner Jerry Jones is as hands-on as any owner in the league, and he was just enshrined in the Pro Football Hall of Fame, but Allen’s version of ownership, while also wildly successful, is much more about putting the right people in positions of power, then making sure those people are in the best possible position to succeed. 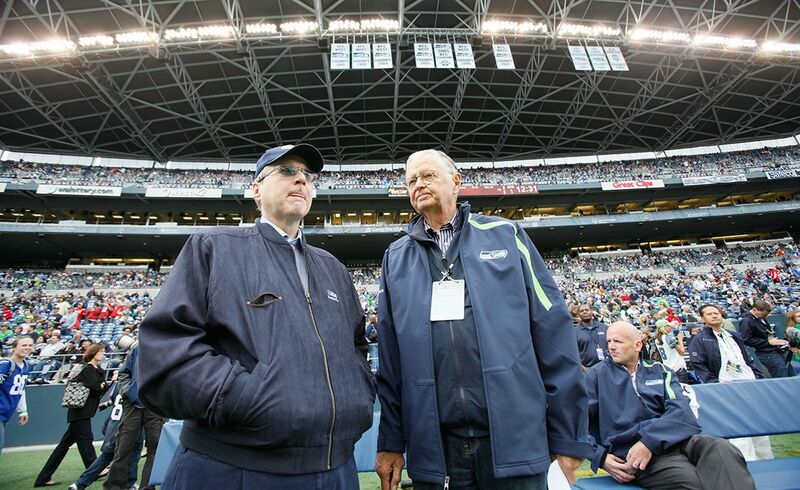 Seahawks owner Paul Allen and former Seahawks owner John Nordstrom stand at CenturyLink Field during a September 2010 game in Seattle. 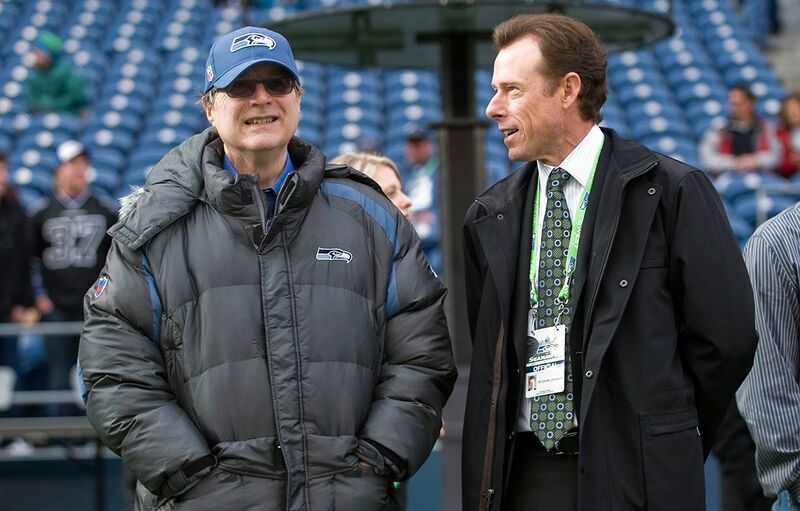 In turning the Seahawks into one of the league’s model franchises, Allen has shown a remarkable ability to be removed from the spotlight while also having his fingerprints all over the most successful elements of the organization, be it the process of getting a stadium deal done to keep the team in Seattle, or the important front office and coaching decisions that have shaped the on-field product as well as the team’s business success. “Paul’s very unique, and in that he demonstrates a great trust in us, in what we’re doing and that which he stands for,” Carroll said. “For John Schneider and myself in running the program, that is so powerful for us. And it allows us to think freely, think outside of the box, be willing to take chances and the kinds of risks that get you real great rewards. “He’s A Very Inquisitive Individual. He’s Always Thinking About What’s Coming Next"
While Allen gives his employees the latitude to do their jobs, that shouldn’t be mistaken for complacency or disinterest on his part. Allen isn’t going to tell Carroll how to coach his team on Sundays, or tell Schneider how to set up his draft board, but you’d better believe those two, along with McLoughlin, keep their boss in the loop and listen to his feedback. Allen is an involved, hands-on leader when he needs to be, he’s just not an overbearing one. Whether it’s decisions McLoughlin oversees on the business side, helping the Seahawks succeed financially while providing for fans the league’s best gameday experience, or methods used on the football side of things that help players “find their best in all areas,” the Seahawks have been one of the league’s most cutting-edge teams, hardly a coincidence for a franchise owned by one of the world’s most successful innovators. “Paul is a person who doesn’t just accept the status quo,” said Bert Kolde, vice chairman of the Seahawks and senior director of Allen’s Vulcan Inc. “He tries to make it better. He tries to be the best, to make the organization be as successful and be the best it can be. And he will ask questions. He’ll challenge people to think out of the box, to not always just keep doing things the same way they’ve been done the last 20 years, but to look at doing things in more innovative ways. Before he purchased the Seahawks, Allen had already, to name a few things, co-founded Microsoft, launched Vulcan Inc., began the process of transforming Seattle’s South Lake Union neighborhood, given millions to various philanthropic causes, owned an NBA franchise and beaten cancer, so he really didn’t need a successful NFL franchise to validate his legacy. That said, once he bought the Seahawks, he had no intention of failing. Allen’s leadership style may be hands-off at times, but he’s also willing to take big risks to succeed. To get his team on track in the late 90s, Allen and the Seahawks brought in one of the league’s top coaches, Mike Holmgren. 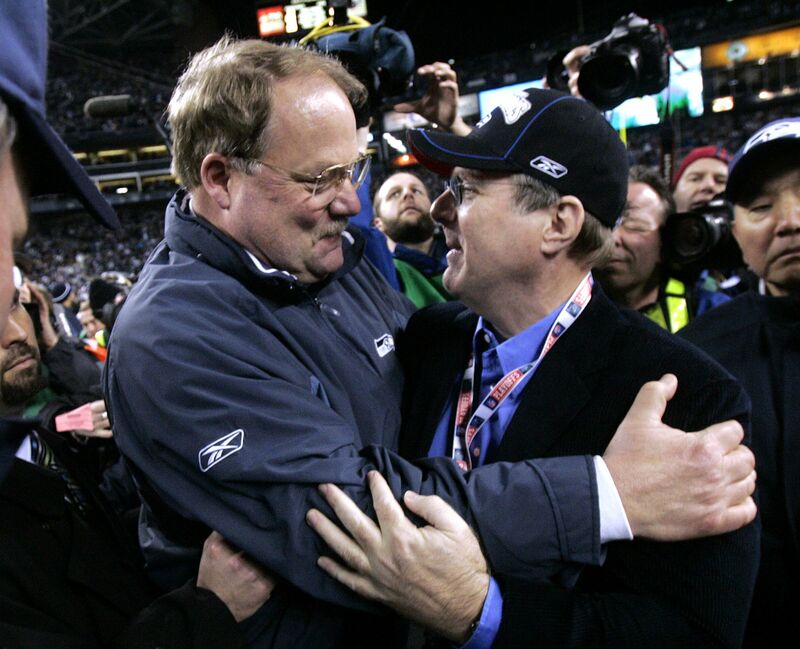 Seahawks head coach Mike Holmgren embraces owner Paul Allen following the team&apos;s 34-14 NFC Championship victory over the Carolina Panthers on January 22, 2006 at Seattle&apos;s CenturyLink Field. Whether it is to hire coaches or allow front offices to acquire and retain players, Allen has never been hesitant to commit financial resources. And when the team had a bumpy couple of years, Allen pushed the reset button and brought in Carroll and Schneider, who along with McLoughlin have formed one of the league’s best and most harmonious front offices. And perhaps nothing better illustrates Allen’s leadership than the utter lack of dysfunction or conflict at the top of the organization with McLoughlin, Carroll and Schneider in charge. It’s commonplace in the NFL to hear about tension between coaches and general managers, or between ownership and football operations, but thanks to the contract extensions Allen and McLoughlin negotiated with Carroll and Schneider last summer, the Seahawks are looking at a decade-plus of harmony, and, based on what has taken place so far, at on-field success as well. President Peter McLoughlin, owner Paul Allen, head coach Pete Carroll, and general manager John Schneider are pictured together in October 2014 at the opening of the Seahawks&apos; &apos;We Are 12&apos; exhibit inside the Allen-owned Museum of Pop Culture. 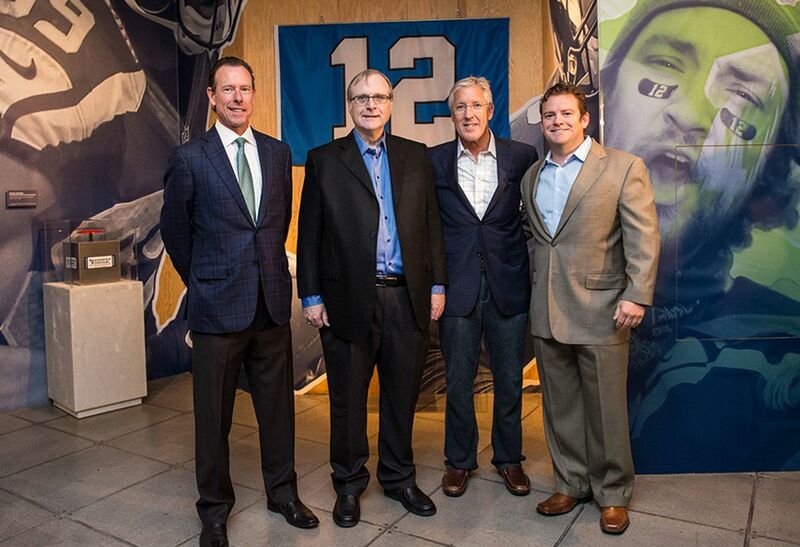 President Peter McLoughlin, owner Paul Allen, head coach Pete Carroll, and general manager John Schneider are pictured together in October 2014 at the opening of the Seahawks&apos; &apos;We Are 12&apos; exhibit inside the Allen-owner Museum of Pop Culture. And people have taken notice of the environment Allen’s leadership has created over the past 20 years. Not just because the Seahawks have been so successful, winning nine division titles, three NFC championships and one Super Bowl, but because of the unique culture Allen created in Seattle.